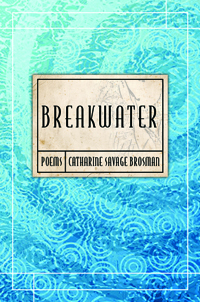 Breakwater, Catharine Savage Brosman’s new collection, presents a wide variety of lyrics, narrative poems, and meditations in free verse, blank verse, rhymed quatrains, and other forms. The initial section is autobiographical and displays her broad range as she recounts and embroiders on the experience of falling in love again, after many years, with her first husband, whom she has subsequently remarried. The second part, which includes several narrative poems, deals with others’ experiences, especially women’s, in their careers, their loves, their historical situations, their dramas. Among figures who appear are D. H. Lawrence, Mina Loy, and Madeleine Gide, the wife of André Gide. This part concludes with translations of Renaissance love poems by Pernette du Guillet, a French woman poet. The final section contains several poems on moral and religious themes—centered on famous edifices in Europe—as well as lyrics on birds and butterflies, and poems on war and associated matters. As in her previous collections, many tones are found here, from light to somber, and a range of voices, experiences, settings, and figures. Whether she is describing the flight of egrets, a bougainvillea vine, a family running from the Nazis, the beauties of Unaweep Canyon in southwestern Colorado, or adventures of the heart, Brosman’s technique allows her to convey the very essence of her topic by those incantations and “immaterial conceits” (as the poem Éventail puts it) that are the mark of exceptional poetry.